James Gunn’s new novel Transcendental came out from Tor Books a few weeks ago. If you haven’t read it, go get it. It’s a page-turner, full of SF goodness–particularly when it comes to cool alien species. I first heard Jim read from the book during the summer I took his Intensive Institute on the Teaching of Science Fiction at KU. 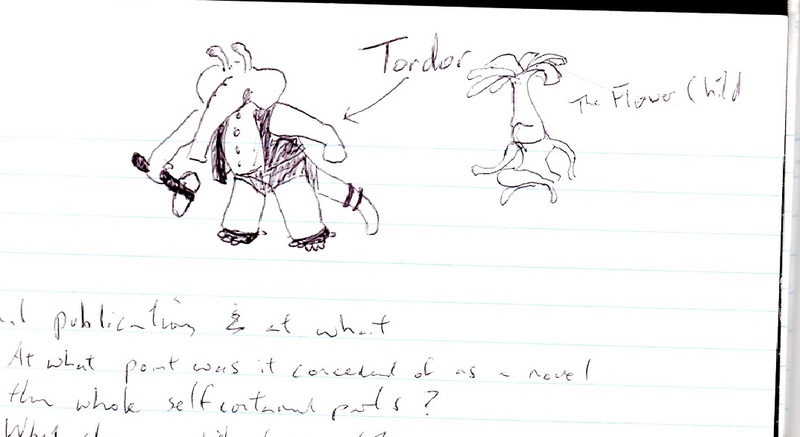 Along the way, I sketched some of the aliens in my notebook for the class. 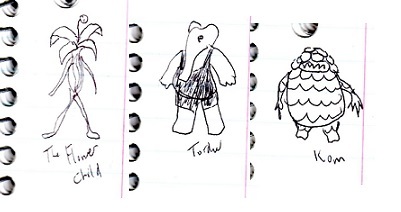 Above are Flower Child 4107, Tordor, and Kom the Sirian. These were first impressions based on hearing the first chapter and “Kom’s Story” read aloud to the class. In between the time I drew these and the release of the novel last month, Jim’s become a Damon Knight Grand Master in the Science Fiction and Fantasy Writers of America, and been Guest of Honor at Worldcon , and served on my dissertation defense committee. (Okay, that last one’s less of an achievement.) I’m honored to call him a mentor. I sent him the ones below, from another page of the same notebook.